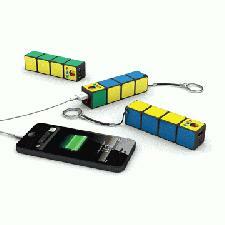 Get your brand all charged up with the Rubik's Cube Power Bank! By combining the iconic Rubik's Cube with the practicality of a Power Bank, this is a promotional item that your customers are sure to love. This branded product has a 2600 mAh capacity and will take 2-3 hours to fully charge. It also includes a Micro USB connector to charge using USB ports. This fun and funky promotional gift lends itself to bright colours and branding to get great brand exposure and catch your customer's eye. For more information or enquiries on our Logo Branded Rubik's Power Bank, fill in the form and we will get straight back to you.